Sizes 8", 10" and 12"
*May vary slightly depending on the style of Base Jaw required. 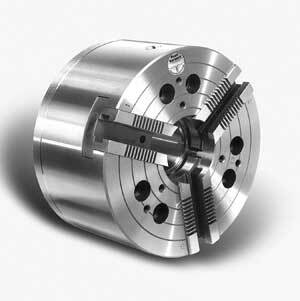 **Special thru-holes available: 3-1/16" for 10" chuck; 4" for 12" chuck. 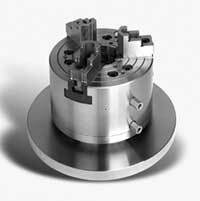 NOTE: As shown in photo above, flanged base plate is supplied less slots or mounting holes. PBA can machine as required for an additional charge. For dimensional and performance data, reference the above. ***Chuck numbers shown are for Cincinnati machines with 2 hydraulic ports in spindle. Consult factory for part number of 4-port spindle designs.